Funny T shirts | About The Blue Moon Trading Co. The Blue Moon Trading Co. is a T shirt store with a unique selection of funny special T shirts for funny special people. The company was founded back in 2006 by a somewhat mysterious ex-comedian who really just wanted to make random humans smile and also earn enough money to move out of his car. And as of today, we are proud to say that we still live in our car (seriously), but we have successfully made a number of random humans laugh and smile. Unlike some items and contrary to popular belief, our shirts are not mass produced by slave labor in a hot chinese sweat shop. However, the ideas are produced en masse in our minds while we think about hot sweaty chinese slave girls in a coffee shop, so it kinda evens things out. Since we are still a growing company, we are currently using what can only be described as the Creme-de-la-Creme of POD services (Cafepress,Zazzle,RedBubble etc.) to bring our unique vision of reality to you, the adoring masses. Here at The Blue Moon Trading Co., we understand that there a lot of T shirts out there to choose from. Some of them are sprawling landscapes of artwork while others are sprawling landscapes of whale dung. We at The Blue Moon Trading Co. strive to be neither sprawling artwork or whale dung, but a delightful mix of the two. And the fact that you have chosen or are considering one of our fine T shirts puts you miles ahead of the rest of the chimps. So we would like to personally say, 'Thank You Very Much' for purchasing or just for viewing the designs. 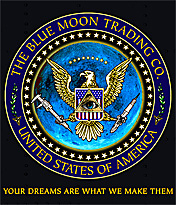 The Blue Moon Trading Co. 2011- All Rights Reserved.